It’s only fitting that 1963’s America, America is frequently described as filmmaker Elia Kazan’s greatest labor of love. For despite being Kazan’s most beloved work from among the countless cinematic classics he labored over throughout his legendary career, America, America is a film that's particularly laborious to sit through. Proof that even a director’s love is blind, Kazan’s movie -- that only recently made its DVD debut -- is an emotionally draining three hour cinematic reminder that sometimes writing what you know is a recipe for disaster since the closer you are to something, the harder it is to remain objective. While unfortunately the end result was an absolute disaster, Kazan’s intensely indulgent personal opus was nonetheless made with the very best of intentions and for all the right reasons. Setting out to pay tribute to his family tree, the overly ambitious filmmaker decided to adapt his own book by the same name, which chronicled his uncle’s arduous journey from Turkey to the United States. Owing perhaps to his background with The Actors Studio and experience with method performers such as Marlon Brando and James Dean , Kazan’s penchant for emphatic speeches and powerfully explosive scenes that ratchet up conflict from 1 to 100 in mere seconds grows unbearable even before the misguided mess of a movie reaches its halfway point. And given his otherwise unparalleled knack for visual scene composition , had the screenplay been penned by someone else, it’s safe to assume that Kazan would’ve easily been able to distract us from any weaknesses in structure as evidenced in the director’s groundbreaking ‘50s masterpieces. 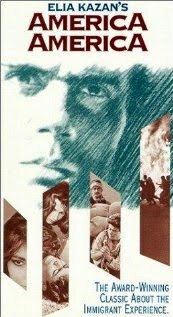 Yet, similar to the way that America's hopeful dreamer turned hopeless schemer Stavros (Stathis Giallelis) gets so caught up in his goal to escape the oppressive Ottoman Empire and bring his family to the United States that he begins to lose his humanity along the way, Kazan simultaneously loses his cinematic eye in the process of translating the odyssey to film. Undoubtedly overwhelmed by ambition and seduced by epic excess, because we can't help but question some strange decisions made by the director from the very beginning wherein one scene contradicts or even cancels out another, it seems evident that instead of relying on his usually rock-solid instincts, Kazan second-guessed himself and reworked material to the point that it no longer works. Episodic rather than seamless, America, America is ultimately best appreciated for some of its individual scenes and a few memorable supporting characters since there's little else to recommend it except as a curiosity. Moreover, the bloated 168 minute running time is completely unnecessary as it takes a full hour for Stavros’s journey to actually begin. And in fact, after looking at my notes I realized that at least 90 minutes could’ve been easily discarded without impacting the main plotline in the least. But oddly, what’s even more puzzling about the length of America, America is that Kazan and his (most likely frustrated) Bonnie and Clyde editor Dede Allen waste so much of the three hour edit to the point that when the movie ends, we have absolutely no idea what's happened to at least a handful of characters. Arguably, yes, in reality people flow in and out of our life all the time but when you're being presented with a narrative film that's also based on a book, it's kind of strange to have this many loose ends. And this flaw is particularly obvious since instead of listening to Tom Hanks tell strangers about his life on a bus bench in Forrest Gump , in America, America , we're watching Stavros undertake a journey in present tense rather than in the past. However, given the Academy of Motion Picture Arts and Sciences’ love of long drawn out epics and honoring the legacy of directors the Academy has saluted before, it isn’t as shocking as it should be to discover that America, America garnered an Oscar nomination for Best Picture. 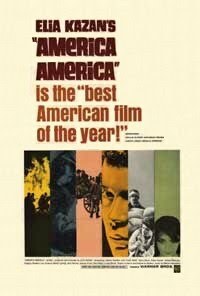 Similarly, even though I can’t imagine watching it again, its place in the Library of Congress’ National Film Registry is nonetheless warranted because of the unique immigration story angle as well as cinematographer Haskell Wexler ’s absolutely staggeringly beautiful visual execution of America, America. More than just a brilliant professional foreshadowing of the cinematographer's landmark career to come, Wexler's imagery works so well in telling a far more compelling story than the overly melodramatic one Kazan is offering that some critics have argued America would've fared better as a silent movie. Yet that’s the biggest problem for those of us who still remember how blown away we were by the director’s staggering achievements via movie moments that will forever remain ingrained in our mindscape from East of Eden to Streetcar Named Desire to On the Waterfront and more. Thus, the discovery of another unearthed Kazan work immediately ramps up our expectations when we uncover the fact that America, America has not only never been released on DVD in the United States before but is also the filmmaker’s most beloved work. But despite the realization that the fearlessly ambitious movie is a disappointment overall, it’s sure to be of interest to other classic film devotees to judge for themselves as well as be reminded that sometimes "labors of love" are aptly given that label for a reason.